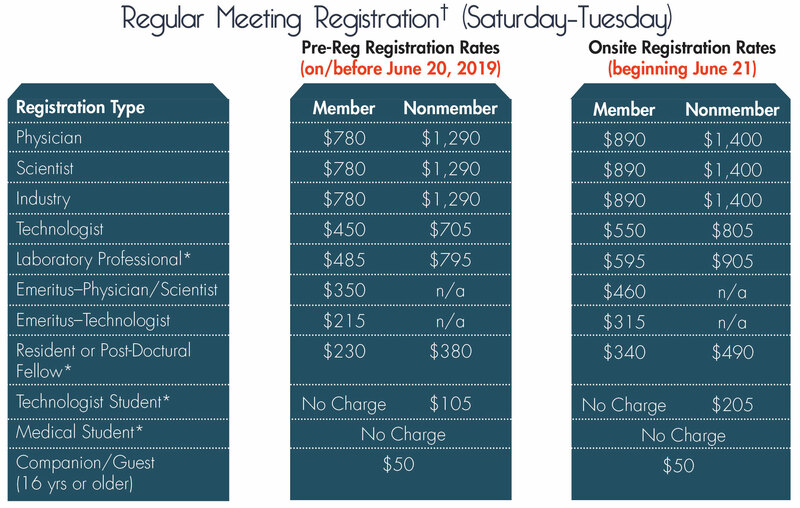 Registration fees for the SNMMI 2019 Annual Meeting are listed below. Please note: Specialty Workshops require an additional registration fee. Weekend registration includes a categorical course with the exception of technologists/technologist students who will receive additional CE course credit beginning Saturday in place of the eliminated tech categorical. If you have registration questions, please call 800.929.3369 (US/Canada) or 240.439.2947 (International). This event will be photographed and videotaped. By entering the event premises, I consent to photography and video recording and its/their release, publication, or reproduction to be used for promotion or any other purpose by SNMMI without compensation. *Resident Nonmembers and Student Nonmembers (Resident, Scientist In-Training, Medical/Graduate/Technologist Student) must submit a completed verification form. Technologist Student, Medical Student and Resident-In-Training fees do not include CE Credit. Residents-In-Transition do receive CE Credit. Technologist Students wishing to claim CE credit must register as a Technologist. †Regular Registration does not include categoricals or specialty workshops. These events require an additional fee. Weekend registration includes a categorical course with the exception of technologists who will receive additional CE course credit beginning Saturday afternoon. New for 2019! The SNMMI Virtual Poster Hall is now included with your Annual Meeting registration, giving you anytime access to nearly a thousand Scientific Abstract Oral and Poster Presentations available at the Annual Meeting! Get access to 100 of sessions, recorded live at the SNMMI 2019 Annual Meeting. Learn more about the SNMMI Virtual Meeting. †Regular Registration does not include the Pre-Meeting Categorical Sessions or Specialty Workshops, which require an additional fee. Weekend registration includes access to the Categorical Sessions. Please note that Technologist Student and Resident-In-Training Fees do not include CE Credit. Residents-In-Transition do receive CE Credit. Registration Cancellation/Change Policy: Cancellation and change request must be received by May 10, 2019 to qualify for a refund less a $75.00 cancellation fee. No refunds will be issued for cancellation and changes received after May 10, 2019. Refunds will be processed based on the original form of payment within 30 days after the completion of the meeting. No shows will be charged the full registration fee. No refunds will be given for any reason after June 28, 2019. By participating in the SNMMI Annual Meeting, you agree that any photographs which contain your image may be used with SNMMI's discretion in marketing, website and print materials.